Come for the Workshop: Stay for the Weekend! Make your own Retreat. What could be more fun than finishing something you are writing? A Discussion of Craft! Yet, so many writer's workshops and conferences throw you by smothering you with information. You end up overwhelmed and tired. Instead, relax with other writers, go deeper into one specific element of Craft that is related to where you currently are in your writing, and discover how to unwind before you start writing. Optimal Learning requires and Environment that supports YOUR Process. A story is like a Russian Doll with smaller stories nestled within each chapter: if these subtle storylines are not present, it’s perhaps a fairytale or a myth. Yet, even the epic mythical tales of Homer have subsets of story nestled within a larger story arc. In a short story, as in the chapter of a novel, a scene begins and ends when some aspect of the cast of characters is either diminished or augmented. Yet, the chapters must give relatively equal weight and length to each perspective they provide. To select what to include and what to leave out is the challenge of every beginning novelist, and often beginners actually spell out too much, when to allow developments to unfold entices the reader more thoroughly. The complete freedom of fiction can be overwhelming. Join us for a closer look at how to use these elements, with awareness of their potential impact. Learn to use them to provide a sort of compression chamber that has the potential power to make the story take off, like rockets in the sky. 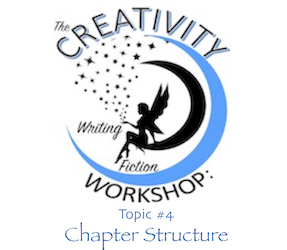 In this workshop, look at scenes versus chapters. See what they say back to you. It is not the answer to a problem but does require some inevitable resolution. How does this apply to your work in progress? As in art, so in fiction. Perspective is everything. It changes what's true. Sign up with your email address to receive updates as soon as new events are released!